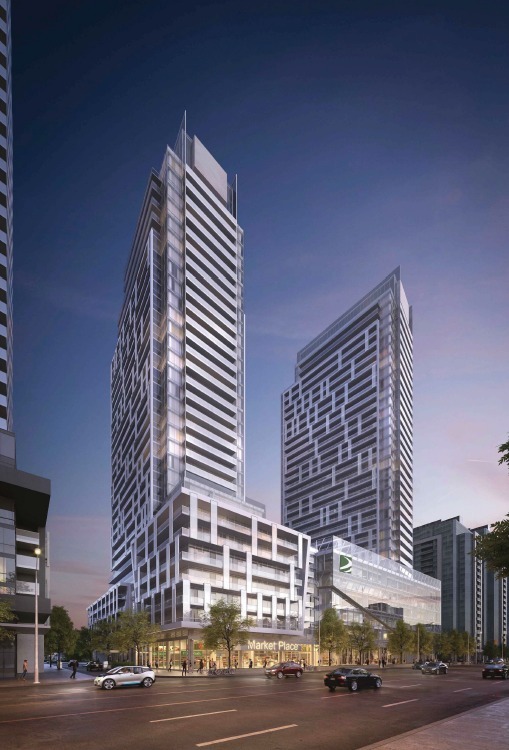 M2M Condos is the 5 condominium redevelopment of the Newtonbook Plaza located just north of Yonge & Finch. In an area crying out for high density development and just steps from the Finch Subway Station, M2M represents a huge opportunity for investors to invest in the first of five new condos in this prime location. M2M Condos will be launching in the coming weeks. To register for guaranteed first access, click the button below and get on our priority access list. Roy Bhandari: Welcome to a very special episode of the TalkCondo Release Radar. Today we’re going to do the top reasons that we’re excited about a very special project called M2M Condominiums. This has been a project that we’ve been gearing up for now for the last four to six weeks as information started to seep through. We’re getting a lot of interest from the buyers and for good reason. Roy Bhandari: We’re going to dive right into the top reasons. The first reason that we’re really excited for M2M Condominiums is the location itself. Give us a quick run down, Amit, of the location of the project and some of the key takeaways there. Amit Bhandari: Sure. So, the overview look of where the site is. It’s just North of Yonge & Finch, about a couple of minutes walk to the Finch subway station, North of the station. The exact corner is Yonge & Cummer. The plaza in question, which was purchased last year, that’s the site of the overall development itself. Roy Bhandari: So, I do want to highlight, you mention it’s taking over the plaza? Amit Bhandari: And it’s going to be a massive plan, multi phased as well. Roy Bhandari: We’re definitely going to talk about that. Roy Bhandari: I did want to hit on the subway. You’re steps to the Finch subway station, we cannot emphasize how important it is for high rise condominium, urban development, to be close to a subway station. Roy Bhandari: We see time and time again condominiums closer to the Subway, out perform condominiums not closer to the Subway. Roy Bhandari: So this is a great opportunity where we’ve got a multi-phased project near a subway and we’re getting it at level one, so we check a lot of boxes here. Roy Bhandari: Which leads us nicely into the second reason that we’re really excited about M2M Condominiums and that is that it is the first tower of a multi-phased five tower redevelopment. Amit Bhandari: Yeah, we’ve talked about this at length a few times. What we’ve seen is any time there’s a big ground plan to develop a mini city almost, in this case, five towers, it’s always beneficial for an investor to get in as early as possible because our real estate works as any subsequent launches, and priced a little bit different. Higher than the previous one. So it’s always important to get in as quick and as early as possible. Amit Bhandari: So that’s the big benefit of buying into a multi-faceted, multi-phased development. We’re huge fans of that strategy. Roy Bhandari: It’s a great strategy and it’s one that has time and time and time again paid dividends. Roy Bhandari: We look back over the last decade or so and we can call out so many examples of people who bought into a vision before the reality and have earned huge returns. Just rhyming off a couple … Regent Park, Daniel’s Downtown Toronto. Roy Bhandari: Emerald City at Fairview Mall. Now, eight condominiums, but the first few were the ones where they’ve seen enormous returns because you’re buying into that vision and it’s no different here. Amit Bhandari: Yeah, it’s big. Basically, the developer, Aoyuan, they purchased this site for 200 million dollars last year. Amit Bhandari: Yeah, it was the largest single transaction in 2017, in Toronto. So, the plan, the vision, for the site is five towers. The first phase, or the first batch of buildings, you’re going to have a 34 story and a 36 story, with an 8 story podium. So that’s going to be phase one. Amit Bhandari: The plans are really interesting, [inaudible 00:04:57] I’m very excited, because I know that Newtonbrook Plaza, it’s a big draw for the neighborhood because of the retail. But the developers do have plans for retail for this development. Amit Bhandari: Just some numbers I’m going to shoot off. Almost 40,000 square foot of retail planned. Amit Bhandari: There’s a touch over 40,000 of commercial office space, which is also really, really important, because obviously if you’re replacing a plaza, which is obviously a job center on its own, you have to replace it with something meaningful. And obviously taking over the eleventh story, adjacent office building, replacing it with a substantial square footage. Amit Bhandari: Yeah, so I’m going to mention that after. So, the other key thing here is to take care of all those new people. Office, residential, retail people. They’re actually building a full level underground parking garage. To be able to take care of and manage all these people. Amit Bhandari: The other amazing thing is, we talked about 8.6 acres, if you look on the site, you have surface parking, retail structures, surface parking. So, it’s the stuff behind the plaza’s surface parking that’s actually being turned into a playground and park. Amit Bhandari: It’s just amazing to see because you don’t always see developers like this … We’re going to talk about the developers and their vision later, but it’s not very often you see a developer give back to the public. Give back to the city public space. Public usable space. Amit Bhandari: Absolutely. Where they could easily add four towers on that spot. But they’ve chosen not to and they’re going to build this beautiful green space. Roy Bhandari: I wanted to go back to something Mike said very quickly, which is about highlighting what makes a good master plan verses a bad master plan. Based on what we’ve seen in the past, not all master plans are treated equally. And when we identify certain elements that are not in a master plan, the reason we highlight this is because the ones that don’t have these elements in them, what tends to happen is that the prices tend to flat line and the rents tend to flat line. The missing retail component, or the missing commercial component, or the missing a public space component. Amit Bhandari: The missing a draw to what will bring people in. Who are in and stay and want to live in the particular building. Mike Santos: We haven’t even mentioned the double high gym. 3700 square feet. Something to keep people in as well. Mike Santos: It’s a huge component of it, in terms of amenities and things like that. Mike Santos: Everything is tied together within everything. Roy Bhandari: So I do want to transition next into the number three reason we’re excited for M2M, and that is the developer. We were very fortunate enough, me and Amit, to be invited to a dinner with them and get to understand Aoyuan. They’re a new developer in Toronto, but one of the largest developers on the planet. Roy Bhandari: Last year, just to rhyme off some quick stats, in 2017 Aoyuan sold 9 billion dollars of real estate, globally. So go through some of the key points we need to be mindful of Aoyuan. We were blown away when we sat down with them. We were really excited. Amit Bhandari: They’re a very interesting company. They’re not new. They were actually founded in 1996. They’ve got over a 100 major residential and commercial developments across the glove. So, their primary focus more recently has been China and Australia, and now Canada as well, in Vancouver and Burnaby. And they’ve made some significant land purchases in Vancouver as well. In 2017, I spoke about the 200 million dollar purchase in Toronto, but they made big, big purchases in Vancouver as well. Amit Bhandari: So, they mean business. They’re here to stay and they do want to create a very big presence. They, like I said, reported 9 billion worth of real estate sales last year. It’s an interesting one. Amit Bhandari: Their claim to fame, they created a really interesting community. I don’t know how to pronounce it correctly, but Ganzu in China, where they combined sports and recreation into the development. They were actually one of the pioneers in the world to do this sort of amalgamation of the two. And they were endorsed by the International Olympic Committee, so they know what they’re doing. Especially if someone like the Olympic Committee knows and endorses their work. Amit Bhandari: So they’re world renown. They’ve got some fantastic developments and they’re very forward thinking. And I think we expect so see the same thing at M2M as well. Where they’re going to bring all this high caliber workmanship, beautiful design. We’ve seen the renderings. The renderings are fantastic. Amit Bhandari: The other key element with Aoyuan, is, and I think it’s a very, very important thing, is they’ve hired local talent. Roy Bhandari: Well, we’re going to talk about that next. That transition is next. Yeah, the reason we’re excited for M2M and it’s the fact they’ve hired local expertise. Roy Bhandari: Yeah, a disconnect between what that team believes the neighborhood wants as opposed to what that neighborhood actually wants. Roy Bhandari: Some of the best of the best. Amit Bhandari: Yeah. They’ve met with skilled, very high caliber people. Roy Bhandari: From the architect, they’ve hired Wallman Architect, were the top Toronto based architectural firm, so they started from the top. Roy Bhandari: But the people managing the project, from, we hate to say it, but other developers that they’ve moved from those developers to Aoyuan, to bring this vision to life. And what they’ve done is they’ve bought the best of the best from these companies. And we’ve really seen that come to life in the vision that they’re presenting for M2M. Roy Bhandari: One of the things that really stood out to us was that the importance of this plaza to the local community. As we’re talking to buyers who live nearby, over and over and over again what’s been a common theme, is how important this Newtonbrook plaza is. People have memories there, it’s a convenience for the retail. So it’s a very important piece and talking to M2M, we’ve seen that they do not take this lightly. Whatsoever. Amit Bhandari: Well, they’ve called the project M2M, which is the postal code as well, so. Amit Bhandari: Absolutely, the work that they’re doing here and the things we’ve said already, it hits all the right points for me. I think this is going to be one of those developments that I think the local populace will appreciate once it’s built. Because it will bring a lot to the table. Amit Bhandari: Another important thing is, we speak about the location itself being so close to the Finch station, we have to remember that that’s a rapid transit node. And it’s only natural when we see a city grow to see nodes getting bigger and bigger and more dense. So, M2M, it’s a five towered development, but there’s a lot more to come in this neighborhood as well. Amit Bhandari: It’s been pinpointed for growth. Amit Bhandari: It’s a big positive. Because it will only draw more jobs. It will draw more retail. And this is a fantastic first new development within that neighborhood that will take that even further. Roy Bhandari: Yeah, so it checks so many boxes and that’s why we’re, not just we’re excited, but clients are excited. Like I’ve said, we’ve spoken to so many people already, that the excitement of this project is already building up. Roy Bhandari: So, in terms of the reasons we’ve talked about, the location, the first phase of the master plan, the developer itself and the local expertise, it all really, really comes together. Mike Santos: Yeah, very, very nicely. Roy Bhandari: So in terms of timelines. Like I said, we’re recording this at the beginning of April. We’ve been told to expect this towards the end of April, early May. Amit Bhandari: But be ready. Mike Santos: But be ready. Amit Bhandari: [crosstalk 00:14:25] This is an interesting development. It has a lot of things going for it. And in the area that we’re going to see a lot of change because of all this redevelopment and all this intensification. So, we’re excited. Roy Bhandari: So, if you’re interested in M2M Condominiums, reach out to our team and we’ll be more than happy to help.